I carefully cropped out the ‘2015’ in this image. Pretend it says 2016. This year’s tech IPOs have shed nearly 30 percent of their value from their respective peaks, a larger figure than this publication expected given record-highs in the markets and increasing chatter that things are looking up for flotations. 2015 went down as a dismal year for tech IPOs, a concept that looks nearly cute compared to the disappointment that is tech IPO frequency this year. Regardless, the narrative is changing slightly. Put on your nerd caps. We’re going in. Tech IPOs started off the year not even crawling, although the pace slowly accelerated through the year through to the start of October. Cadence increased to such a point that these pages were forced to consecrate an IPO Week, an essentially paga-capitalistic bacchanal involving both coasts and many wallets. Starting with 2015’s tech IPOs, the following are good outlines. You can compare that headline to the first shared in the body of this piece, and then the current headline of this piece and understand why we’re having a chat. Things are a bit less good now. Getting to the numbers with speed, at the current tip, the 2016 US-based tech IPO group is up just 15.35 percent from its first day close, as an averaged group. That number, while down from our prior notes of a larger 33 percent gain, is positive nearly all due to the results of a single company. Acacia Communications’ amazing IPO run has seen its shares soar from an IPO price of $23 to a first-day close of $30.95 to a current price of $88.47. 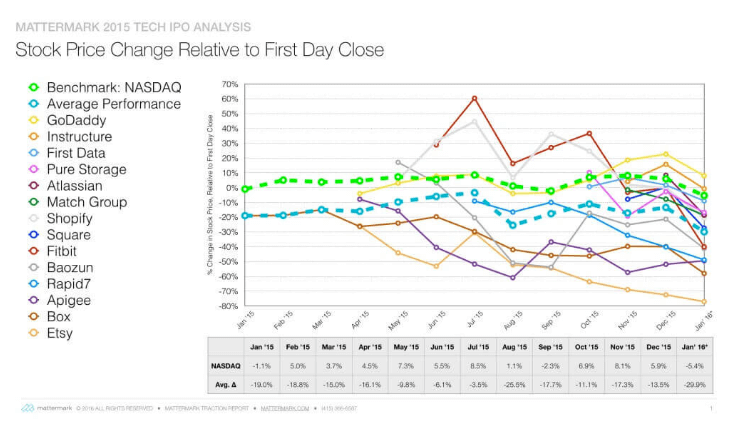 If you remove it from our first-day-to-today comparison, 2016’s tech IPOs are actually down 5.96 percent as a group from their first day close average. Things get worse if you make the comparisons steeper, unsurprisingly. Let’s get mean. Companies trade below their trailing 52-week high, unless they are setting a new record that day. Therefore, most companies are under their own 52-week high at any given moment. 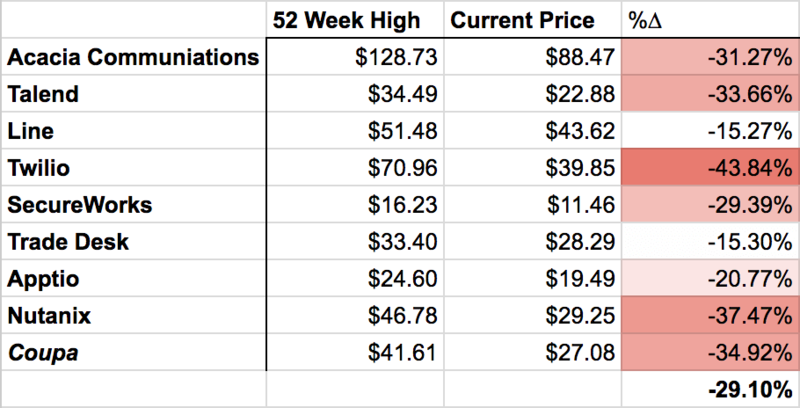 As such, groups of companies will always trade below their respective 52-week highs. 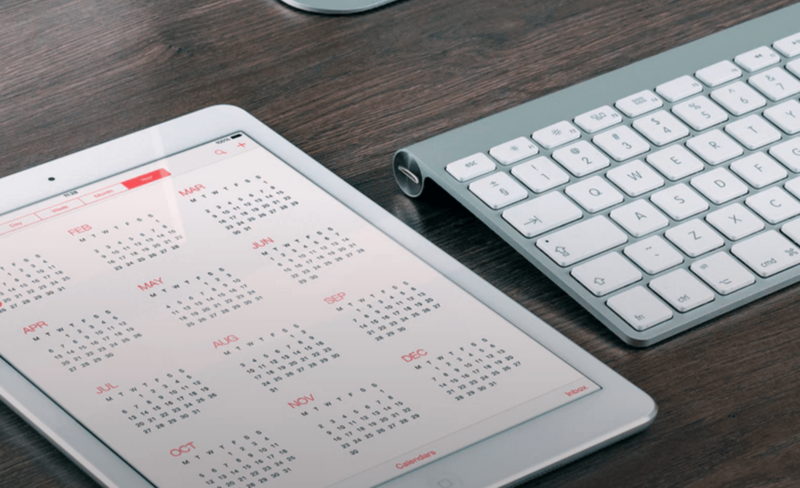 Racing to an end so that you can get back to avoiding email, it seems that the initial performance of this year’s IPOs was bolstered by the breakout performance of Acacia Communications, a fact that we could have corrected for at times. That’s on me. Still, only one 2016 offering is down from its initial IPO price: SecureWorks. The rest are up. So, from that perspective, they are winners. Perhaps just not as big as we had thought. No, Iron Maiden fans. Put your irons down.